The Portico Library’s contribution to Dickens Year is to merge the celebration of Charles Dickens and The Manchester Children’s Book Festival in an exhibition running through June and July in the magnificent and appropriate setting of the 19th Century Portico Library. 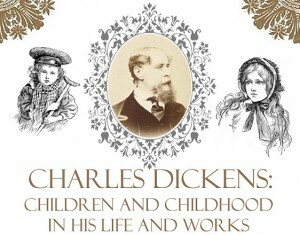 Entitled CHARLES DICKENS: CHILDREN AND CHILDHOOD IN HIS LIFE AND WORKS, this exhibition covers the author, his work and the period in which he lived as it relates to children and childhood. Dickens’ novels are represented by some first editions as well as illustrated adaptations for children, graphic novels and translations, amongst others. Victorian children’s books, toys and games based on Dickens or simply 19th century pastimes sit with model soldiers, figurines, plates, mirrors and the dreaded blacking bottles (which Dickens had such lastingly negative childhood memories of). Silent films alongside magic lantern projections continue to take us through a plethora of exciting, colourful, fun information providing a context within which Charles Dickens, his life and his work sat and how this tied in with childhood and children.